Clinging to the Vine: To Moms Everywhere--Am I the Only One? I went to grab some coffee when I noticed it. Whoever used the Keurig last (a-hem, one of my offspring) left their K Cup in the machine AND they did not replace the mug they used on the coffee station tray next to the Keurig. "GUYS! Am I the only one who knows how to put things back where they go?!" I grumbled to my family, sitting around the breakfast table. A bit later, after the kids were off to school, I went into the kitchen and saw it. Their breakfast plates and cups, piled in the sink. Instead of in the dishwasher, as is our family rule. "UGH. Am I the only one who knows how to put dishes in the dishwasher?" I muttered to myself. 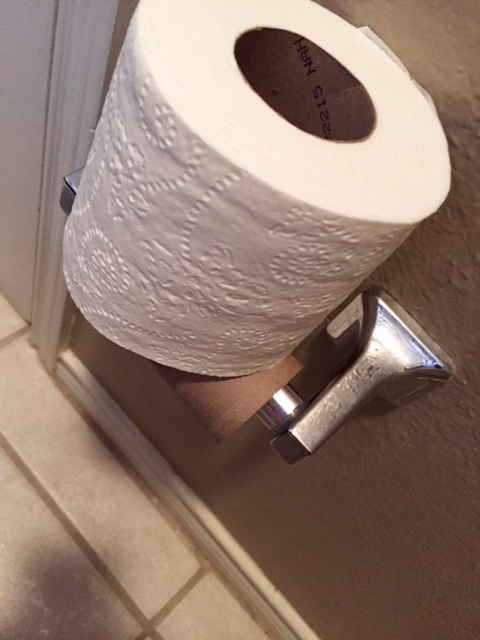 I was completing my morning ritual of walking through the house, doing a quick tidy-up, when I saw yet another offense. To moms everywhere-- am I the only one? The only one who has somehow successfully raised their children to the preteen and teen years, to raise them to the point of even accomplishing such tasks as dressing themselves, preparing simple meals, and driving a car? YET, has somehow unsuccessfully taught the basics of life like-- replacing the toilet paper onto the toilet paper holder?! All too often, as I putter about, I ask myself-- am I the only one around here who knows how to do these things? Things such as rinsing plates, putting shoes away, bringing down laundry and hey-- how about this one-- flushing the potty. Truly, I find it frustrating that despite all my attempts, there are still a zillion things that feel as though it's fallen to me because I guess I am the only one. Yet that's the absolute truth of it all. I am the only one who carried these children within me, feeling their kicks and their hiccups and incessantly worrying about all sorts of things, with a passion only a mother can muster. I am the only one who somehow felt both the eagerness to hurry up and deliver the baby while also fearing the very act of it. Stuck in the place of being ready to not be pregnant yet also feeling so far from being prepared for becoming a mom. The truth of it is that I am the only one who simultaneously wanted to hug and snuggle their little toddler bodies while also wondering how far I might run from all the responsibility when it felt like too much. I am the only one who felt the rage of protection like a Mama Bear while also wanting to put them to bed for the day at 4:00 pm for self-preservation. I am the only one whose heart melted because they stood at the top of the stairs and announced in their preschool sing-song voice that when they grew up, they wanted to marry me. I am the only one who felt the thrill of confidence the first time I discerned the baby's cry and thought, maybe, just maybe, I might eventually nail this Mommy thing. I am the only one who could console them when they were really out of sorts. And it made me feel wanted and needed and capable, while it also made me feel exhausted. I am the only one who nursed their little baby selves and wondered all the live-long day if they were adequately being fed and nurtured. I am the only one who feels the Mommy fears. You know--the far fetched fears like when they play alone on the playground in kindergarten and you just know they are doomed to a lifetime of being an outcast. When you finally voice all the varieties of those mommy fears, your own husband looks at you like you've grown a second head. I am the only one who recognizes that I better enjoy being the number one girl to my boys because some day, their hearts will belong first to another girl. Just as it should be. And I must prepare myself to hand over the reigns of #1 and entrust their affection and devotion to the woman they choose. I am the only one whose heart breaks for them in a million tiny pieces when disappointment and heartache set in. Oh, sure, their dad feels for them, but a mother's empathy is unique. Just as is a mother's intuition. I am the only one who battles gut feelings--both good and bad--that constantly tug at me about each of my offspring. Feelings I must surrender in prayer and fight over in faith to ask the Lord to direct their paths and show them the way and help them to walk in Truth. And I am the only one who shed a few tears last night as my head hit the pillow. Because a man-child had just come in to say goodnight. And as he kissed my forehead and said I love you, I felt the overwhelming surge of pride and sadness and delight and nostalgia. Because 17 years ago, I became a mom for the first time when that darling bundle was born. And these seventeen years have flown by. It's gone by all too quickly. I am the only one with my unique perspective and my irrational, all over the place emotions about this seventeenth birthday. The emotions of joy and bliss and gratitude for all the fun and memories and victories and accomplishments. The emotions of fear and angst about the next chapter that is descending upon us. The emotions of worry and wondering if I've done enough and said enough and trained enough and loved enough. The emotions of pride and wonder at the incredible way that tiny boy has become a young man. Who feels it all in the way that I feel it. Moms are just like that. It's part of our role. Part of our calling. To feel all the feelings and worry all the worries and to ask all the questions and to nag all the children. Moms are the only ones. Our role is different from dad's. Our influence is unique. Our perspective is one-of-a-kind. We are the only ones who treasure up all these things in our hearts, just as Mary did about Jesus. We are uniquely qualified and called in our jobs. To have the privilege of being called Mom. To fulfill roles that we alone can fill. For the good and the bad and the ugly of it all. We moms are the only ones. And yes, sometimes that means, we are the only ones in our household that seem to be ready to tackle the tasks. Oh, there is precious training going on here. As we try to raise the ones that God entrusted to us. And what a privilege it is. To be the only ones.